Earlier this summer, actress Chloe Dykstra penned an emotional essay accusing an ex-boyfriend of long-term emotional and sexual abuse. While Dykstra didn’t name her ex in the essay, fans quickly deduced that she was referring to Talking Dead host and Nerdist founder Chris Hardwick. In the aftermath of the accusations, Hardwick was scrubbed from the Nerdist website, he stepped down from his post at Talking Dead and AMC pulled his show Talking With Chris Hardwick. He’s denied all of the allegations made by Dykstra. On Sunday night, Hardwick returned to the screen for the first time since the abuse accusations. In the Talking Dead cold open, he made a brief statement thanking fans for their support, and straying away from any mention of the Dykstra and her claims, as Deadline points out. He was joined on the show by Community star, Walking Dead super-fan and frequent Talking Dead guest Yvette Nicole Brown, who moderated the TWD and Fear TWD Comic-Con panels in his place. Hardwick also took a moment during the cold open to thank Brown for filling in, saying, “You are a gift on this planet.” Series co-showrunner Ian Goldberg and Fear TWD star Danay Garcia also joined the host as guests on the show. The decision to reinstate Hardwick comes after AMC announced on July 25 that they had completed an investigation into the allegations. He made his first official return to TV with a guest judge spot on an Aug. 7 episode of America’s Got Talent. 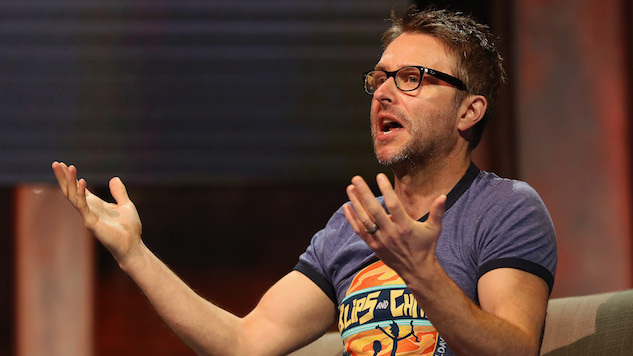 After the announcement that Hardwick would be returning to his post at Talking Dead, executive producer Jen Patton and several other staffers exited the show in protest. Patton had worked with Hardwick for five years, also serving as an exec on Talking with Chris Hardwick and a couple of other AMC talk shows. Deadline reports that Patton and others left because Dykstra was excluded from AMC’s investigation. Dykstra took to Twitter to weigh in on the news that Hardwick would be returning to the screen. Take a look at her comment and Hardwick’s full remarks from Talking Dead’s cold open below, and read Jamie Loftus’ take on the return of accused abusers here. Hello. Normally I recap the show we’re about to talk about here, but instead I just wanted to take a minute to say that I am so appreciative to be standing here right now and I want to thank you, the Walking Dead community, for all of your support these last couple of months. This show isn’t just a job to me, it is a vital part of my life and has been like a sanctuary these last seven years. It’s been with me through good times and bad and I’m so grateful to the fans, producers and the amazing casts of both of these shows for allowing me to come here and be a part of this community every week. It seems like we are on the precipice of great change on both Walking Dead shows in the coming weeks and months and I look forward to going on that journey with you. I’ve said the following words a million times and yet I have never been more thankful than I am in this moment to say: I am Chris Hardwick, and welcome to Talking Dead.